Break into a high-tech military base and finally reach World Tier 5. 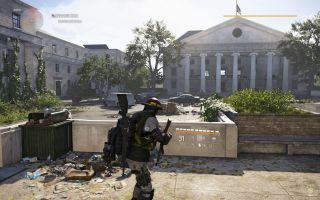 In a livestream for The Division 2, the team confirmed the imminent arrival of the Tidal Basin stronghold, opening the door to World Tier 5 for those who have hit the endgame. The Invasion: Battle for D.C. should flesh out the game further for level 30 players, including new mission invasions, the first gear sets and a new heroic difficulty setting. It's coming on April 5. Tidal Basin is a high-tech military base—think Shadow Moses—full of heavily armed troops waiting for you and your mates. It's a big one, we're warned, but completing it will bump you up to World Tier 5, giving you access to a bunch of new challenges and appropriate rewards. You'll also net yourself one of the first three gear sets: True Patriot, Hardwired and Ongoing Directive. Enemies will start invading more missions and strongholds, and we're promised "the nastiest boss fights" the developers can come up with. A new heroic difficulty mode will knock the challenge up even further, like putting you in a mission with no checkpoints. No gear is locked behind this difficulty, but drops will be better and more plentiful. This will all be accompanied by the first weapon balance pass, as well as a bunch of bug fixes. Another patch is coming even sooner. After tomorrow's maintenance, The Division 2 will be updated to 1.07. Expect the last of the fixes for the ability cooldown issue and performance improvements. After the patch, the game will also take into account the quality of your gear when you're playing with higher level friends, giving you a more appropriate boost. Lots coming in the next week, then. And I'm still far off level 30. Will I ever get there, or will I keep getting distracted by the very photogenic apocalypse? Absolutely the latter.